How often do you feel alone, truly alone, in the wilderness? For most of us, the answer is rarely or never. But last month, a friend and I visited the Bisti Badlands/De-na-zin Wilderness in northwestern New Mexico, and that’s how we felt (though we did, admittedly, have each other for companionship and safety reasons). We never saw another person the entire time we were exploring this wilderness area, and there wasn’t another car in the parking lot or along the several miles of unpaved road leading to the site. Our only encounter was with a rattlesnake, and thank goodness we only saw one of those! Among protected scenic locations in the U.S., Bisti ranks among the least known. With no trails, we were thankful for GPS, which tracked our footsteps into and back out of this strange terrain (though don’t count on cell service). I started off the old-fashioned way, using a map and compass, but with the lay of the land, it was challenging to keep to any course of direction. It’s a fascinating place. The terrain is more like what one might expect to see on the moon, and the rich, earthy colors were fantastic. There are mountain-like mounds, washes, narrow canyons, hoodoos, and strange rock formations that look like cracked eggs. Now a high desert, this was once a swamp inhabited by reptiles, dinosaurs and other creatures. At roughly 60 square miles, we didn’t begin to see it all. After more than three hours of serious hiking and rock climbing in near 100-degree heat, we decided it was time to get out of the sun and look for a cold beverage. I’d love to go back in cool weather with camping gear and a guide for an extended stay. We spent a great deal of time scrambling up and down steep hillsides on our hands and knees, and picking out routes that were often dead-ends overlooking canyons. It wasn’t an easy “walkabout.” It looked and felt more like rock climbing, and I would not have attempted this solo for safety reasons. If you go, be forewarned: There are no facilities of any kind. Take lots of water, wear sturdy boots, and make sure you have a companion. The access roads (there are two ways to get in, including one that is considerably more remote) are located roughly an hour south of Farmington, NM, which is the nearest town with available lodging. In mid-summer and winter, be sure to check road conditions. Snow and rain can make the roads impassable. LAYERS explores the physical process of adding media on top of media, of interpreting layers of meaning in a work of art, and of capturing layers depicted in a subject. This exhibition by the Women's Caucus for the Arts of Georgia (WCAGA) will be on display August 10 through September 26, 2014, at the Jim Cherry Learning Resource Center Gallery at Georgia Perimeter College and will feature approximately 30 artists working in a wide range of media--from painting and photography to sculpture and fiber arts. The artists reception is scheduled for September 11, from 6-8 pm. 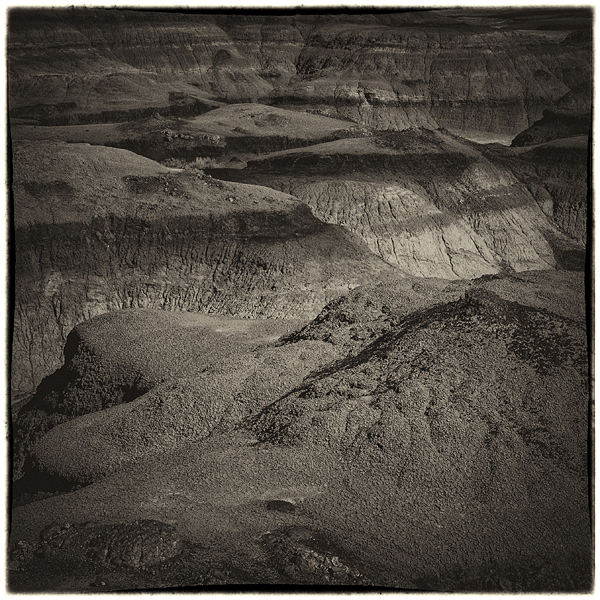 I'll have two black-and-white photographs in the show. Both are part of an in-depth series based on my travels to northern New Mexico to explore the landscape and culture. The Women's Caucus for Art of Georgia (WCAGA) is a chapter of the National Women's Caucus for Art (WCA), founded in 1972 to bring women's issues to the foreground of the College Art Association (CAA) and beyond. The focus was and continues to be supporting, recognizing and educating established and emerging women artists, art historians, critics, curators, museum personnel and other visual arts professionals. The Georgia chapter was established in 2000 by 11 women and now comprises more than 100 artists and art professionals from Georgia and other southeastern states, most of whom are based in the metro Atlanta area. It's just a tiny, unincorporated community, but Chimayo, NM, is famous for three reasons: The Chimayo peppers that grow there and are often sold as ristras--clusters of large, red chiles that you see hanging from portals. The Ortega and Trujillo families, who are widely known for the quality of their weaving, which is done in the Spanish Colonial tradition. And the Santuario de Chimayo, a small church built by a private individual in 1816, which is currently managed by the Catholic Archdiocese of Santa Fe. The church is thought to be a special place of healing, and more than 30,000 individuals seek out the dirt in a tiny back room when they go on a pilgrimage to the church each year during Holy Week. Though small and rustic, the church has an elaborate altar, and just inside the door of the sanctuary is a stunning carved statue of Jesus. To me, the bound hands and scarred arms told the story. It was one of those cases in which showing less conveyed more. New Mexico ranks among my favorite places to visit. That has to do, at least in part, with the fact that my mom grew up there. I have roots, of sorts, in that dry soil. I try to visit often, but it's never as often as I'd like. I was sorting through some of my more recent New Mexico photos today and thought I'd share a few. You can also see images in subsequent and previous posts. This first batch is from the Santuario de Chimayo, a beautiful little church built between 1814 and 1816 in the town of Chimayo, just north of Santa Fe. 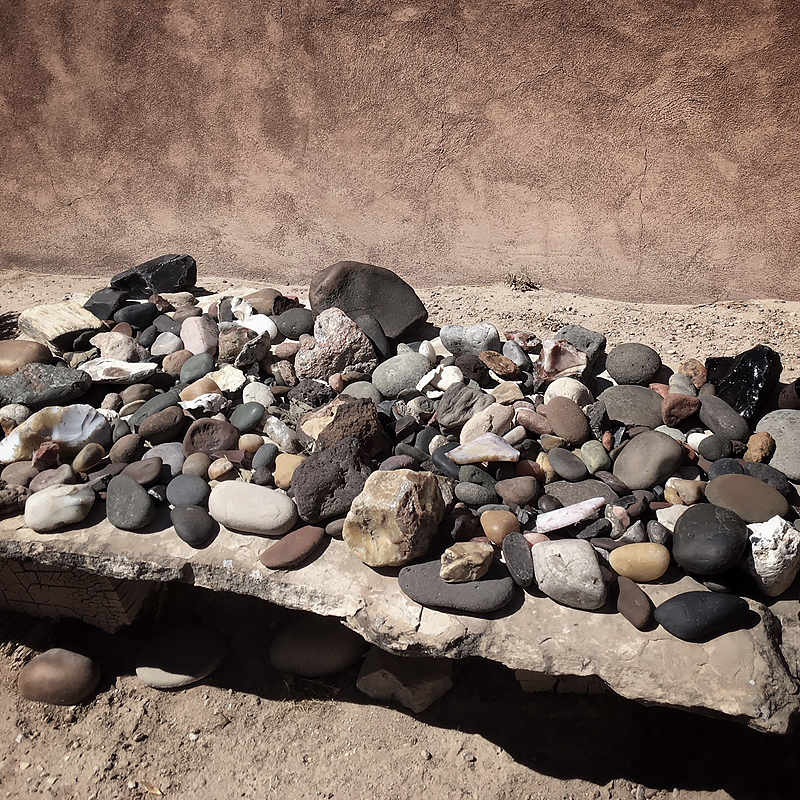 It is owned by the Archdiocese of Santa Fe and is visited by more than 300,000 each year--many of them on pilgrimage seeking spiritual and physical healing. The church is said to be built on soil that has remarkable curative powers. All photos ©2008 Lee Anne White. Deep in the Pajarito Plateau of north-central New Mexico is a mysterious land of hoodoos and narrow canyons known as Kasha-Katuwe Tent Rocks National Monument. "Kasha-Katuwe," which means "white cliffs" and was named by the people of the Conchiti Pueblo, was created as a result of volcanic eruptions that occurred six to seven million years ago. A three-mile (round-trip) trail winds through the narrow canyons and requires a steep scramble (630 foot) to the top of the mesa, where spectacular views of the Sangre de Cristo, Jemez and Sandia mountains and the Rio Grande valley abound. Photos ©2008 Lee Anne White. All rights reserved.